When I was pregnant with my first baby, I felt like I wanted to document all of the little details about my pregnancy so that I wouldn’t forget anything. I also wanted to have something that I could give to my baby one day that they could read and keep forever. There were so many ‘baby books’ in the shops but I didn’t really like any of them, they all seemed a bit structured and prescriptive. So, I decided to just make my own. 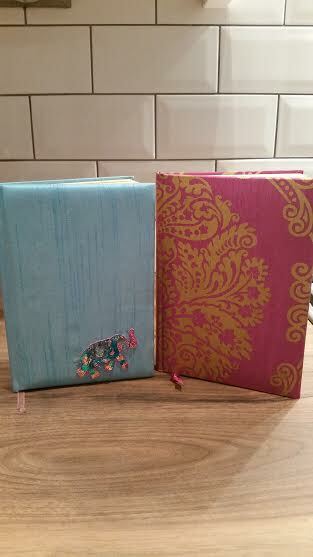 I spotted the green notebook with the elephant on the front and thought it was perfect for a memory book, an elephant never forgets after all. I began by writing about the thoughts and feelings I had when I first discovered I was pregnant. 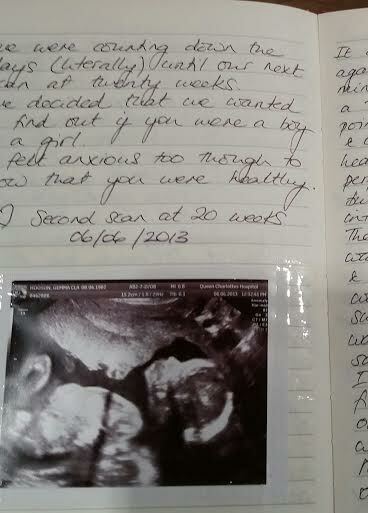 I wrote down how things were going in early pregnancy, any cravings I had, scan photos, everything. I can’t explain how much I loved documenting everything and putting my feelings on paper. It was such an exciting time and when I look back now I can feel that excitement again, jumping off the page. As I had done it for my first baby, I had to carry on the tradition for the second. I found a similar book and got to work and enjoyed it just as much. It made me feel closer to them somehow, like I was talking to them before they had even arrived. They will see how much I wanted them and loved them before I even set eyes on them, I hope that they feel that when they read it. It hasn’t just been a baby memory book, but I have carried it on as the children have got older. I write in it whenever there is a milestone in their lives or if they do something funny. I write about family occasions and things we’ve been doing day to day. I love looking back and remembering things that I know I would have forgotten had it not been for the book. I think everyone should do this in one form or another. Whether it’s online or an old school book like mine, it doesn’t matter. Just write down your memories, you won’t regret it. I hope that my children will love and cherish these memories as much as I do one day.